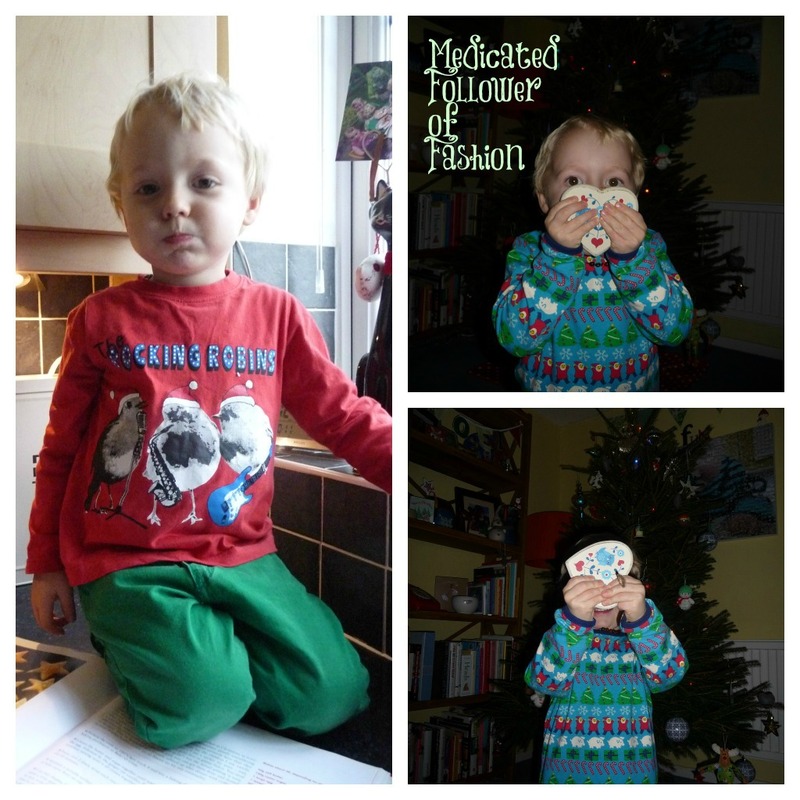 Medicated Follower of Fashion: Trendy Tuesday - Festive Tops! Trendy Tuesday - Festive Tops! Anyhoo, on to today's subject for Trendy Tuesday. Festive clothing! I love a bit of Christmas clothing, I'm a sucker for anything with a fairisle print, or snowflakes.. Even better though is something with Father Christmas on. This year I've found my No.1 favourite Christmas top EVER. It's designed by one of my favourite brands, Smafolk and I bought it via bebaboo.com. They don't have any in stock now unfortunately. Luckily I'm signed up for their emails so as soon as they had them in stock I was able to dash over there and click buy BUY BUY!! I'm glad I did. I love it. I got it a size too big so it should do Ethan for this year and next. I'll be happy to see it come out again! I've bought a couple of other festive tops for Ethan this year, one (pictured above) I bought in a charity shop for 75p (originally from Asda) and the other is a fantastic knitted reindeer jumper from Primark. I got myself a very similar one so Ethan and I can look really cheesy!! Unfortunately I don't seem to have a photo of it on my laptop or phone, but believe me, I will have pics of us wearing them over the next few weeks!! Do you like to buy "festive" clothing? Do you buy a special outfit for your children to wear on Christmas Day? Something else I like to do for Ethan is to buy new pyjamas to wear on Christmas Eve night - all part of the excitement!! I wonder if others do that. It's easy to join in with Trendy Tuesday. Got trendy offspring? Take their picture, blog about it and share with me! These are the "rules"
1) Link your blog post to the linky below. 2) Please display my badge (to the side) and your blog or in your blog post and link back to my blog. 3) Please comment on this post and visit as many of the other linked up posts and comment too. We all love a comment! 4) Tweet me (@medicatedfollow) the link to your blog post so I can retweet it! Thank you all for reading and joining in! Hope you are feeling better. I get Christmas-themed pajamas for my kids,too. I buy a special one for Christmas Eve, and some other ones to wear all December. Love the "Rocking Robbins" shirt! Love the rocking robin top, Ethan looks so cute in his festive tops. I've bought Oliver a reindeer jumper from Primark :-) I love seeing my boys in their nice thick warm winter festive jumpers. 18 week bump - definitely showing.